Steelcase had a vision for the future of work. In line with this vision, they created a workspace at their global headquarters that would foster serendipitous interactions and collaboration between otherwise siloed people. designvox translated the vision's ideas of global community, creativity, and well-being into integrated architectural experiences. Communicating vision through space. We worked with leaders to imagine possibilities and develop a communications strategy that used a 20,000 square foot environment to accomplish business goals through interwoven technology, story, and space design. Inspiring community well-being. From signage to cafe uniforms, the experience worked together to create a space that inspired connections between people and realized the company’s vision of a workplace that organically blended work and life. A window to Steelcase’s world. We created a large-scale digital display—dubbed the Global Wall—that showcased a dynamic stream of community updates and images, company events, real-time news headlines and articles, social feeds and more, simultaneously from Steelcase locations around the globe. Personal nutrition, global perspective. 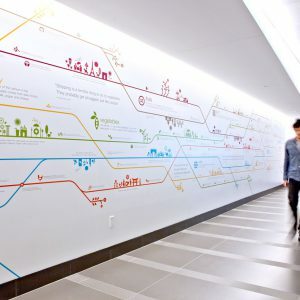 Massive wall infographics wove nutritional information and different cultural takes on mealtime into the experience, driving both a sense of global community and supporting personal well-being.